This page is intended to assist in understanding when the fan should work and provide some diagnostic tips for checking and testing components. It is intended for the more experienced DIYer. Please read the ENTIRE page, including conclusions and the �Fine Print� before starting any actual work. 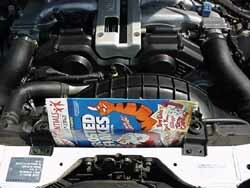 For Z32 owners who are having overheating problems, this item is only one of the many to be considered in seeking a solution. However, if all the �common� causes have been checked and vehicle overheating primarily occurs during periods when the fan should be running, certainly the fan and its control system becomes a prime suspect. In the Z32, the electric fan located in front of the radiator (a �pusher�) is an auxiliary unit designed to come on under very specific conditions, providing extra cooling capacity when needed. In many situations these operating conditions may never be met and the fan may never come on. This auxiliary fan serves to assist both the cooling system and the A/C system. In addition to adding radiator cooling capacity related to overheating, it also improves A/C condenser heat exchange, therefore A/C operation. As you can see, the fan is ECU controlled (A/C, temp & speed sensor input feeds to ECU, output from ECU for fan operation). It is also obvious the fan should not run very often if the cooling system is operating efficiently. 1. Observations: Make sure the fan blades are clear of all obstacles and can turn freely. Their position on the lower part of the Z tends to make them subject to debris collection. I have found plastic bags wrapped around mine and a hunk of styrofoam wedged such that the fan could not turn. 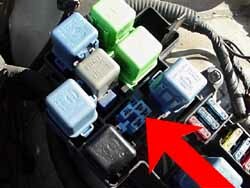 Also check 10 amp fuse marked �air cond� on relay box cover (front of the driver's fender hump under the hood) (1.) and check the fusible link marked �rad fan� in the box directly in front of the battery (2.). 2. System check (read the notes at the end before starting this step): To force the system to behave under the non-speed sensitive conditions, slide a thin piece of cardboard (like an unfolded cereal box) (3.) down between the radiator and A/C condenser (just in front of the radiator cap) to obstruct airflow from the engine fan (which is a �puller�). On a hot day, just partially restricting airflow may work. On a cool day or with a very efficient system, it may be necessary to remove the two top radiator brackets to completely block the airflow across the entire radiator. On a real cool day the coolant temperature may not rise enough to successfully perform this test. Start the engine, turn the A/C on and monitor the temp gauge and fan operation. When the gauge gets somewhat (1/8th to 3/16s of an inch) above its normal position, the fan should come on. If it does, OR if the temp gauge begins to approaches the H mark and the fan has NOT come on, remove the cardboard, turn the A/C off and turn the heater on full hot. Let engine continue to run until engine temp returns to normal. If fan does not operate then troubleshoot starting with step 3, Circuit test. If the fan does operate, it is unlikely the fan operation is the cause of the overheating problem. Note 1: This �trick� will not hurt the car as long as it's not allowed to get too hot or be too prolonged a period of time. The heater assists in the cool down by exiting heat into the cab, and is a good trick to remember if it overheats on the road to control the temp until it can be serviced. Note 2: Making a hole about an inch from the edge of the cardboard and tying a string to it will allow for easy retrieval if it slips too far down. Note 3: The system check is good operational check of the system but not entirely necessary for troubleshooting the system. If desired, simply proceed to step 3, Circuit test. 3. Circuit test: Test the circuitry without the temp sensor in the circuit. Remove the connector for the temp sensor. 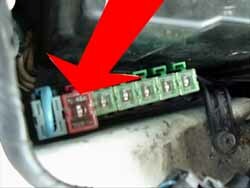 The open circuit will cause the ECU to detect a problem. A short circuit can be created by placing a jumper wire into the connector. 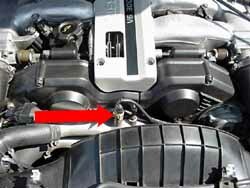 This signals an overheat condition to the ECU. Start the engine and a visual check will confirm if the fan comes on. The temp sensor is the yellow connector to the right of the gauge sender (4.). If fan doesn't come on, go to step 4, Fan relay test. If fan does come on, go to step 6, Temp sensor test. 4. Fan relay test: Test the fan relay located on the left front fender, marked �rad fan�. Do this by turning the headlights on, then off, to prove the headlight relay is good. 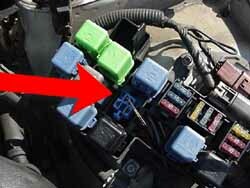 Then swap the fan relay with a headlight relay marked headlight lh (or rh). Check headlights again. If they work normally, the fan relay is good. The fan relay is in the front fuse block, shown relay out (5.). 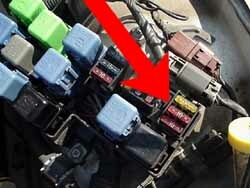 If the fan relay proves bad, repeat step 3, Circuit test, with the good headlight relay in the fan relay position. If the fan now runs, its time for a new relay. Install the relay and you can repeat step 2, System check, or step 3, Circuit test, to prove the cure. 5. Power supply test: Test power supply to relay box with a voltmeter. Remove �rad fan� relay. With ignition on, check for battery voltage at the 2 terminals which face the headlight on the driver's side by placing the black probe on any ground, then checking each terminal with the red probe (6.). Note: A test light can be substituted for the voltmeter by clipping the lead to ground and then touching each terminal with the probe. The test light brightness level should be similar what you see with a battery test. Use of a high impedance digital volt-ohmeter provides safety factors not present in a test light. It is possible that a test light probe in the wrong place could cause damage where the ohmeter would not. Use caution. 5a. Fan/Harness test: Check fan operation by placing a jumper across the two relay terminals closest together. Expect light sparks at the jumper when contact is first made; this should be providing direct battery power to the fan. If the fan runs then reinstall the relay and repeat step 3, Circuit test. If there is voltage at both relay terminals, a good relay, and a good fan /harness, then the fan should have worked under step 3, Circuit test. If fan does not come on, check harness connector at fan (remove, clean, reinstall) and re-test. If the fan still does not come on, test the motor directly. This will require a pair of jumpers directly from the fan connector (fan side) to the battery. Make the connections to the fan first, then the battery. Expect light sparks at the moment of connection. If the fan still does not run, fan replacement is required. Replace and repeat step 3, Circuit test. If the fan does run there is a wiring harness issue between the relay and the fan connector that may require a shop manual, special tools or professional assistance to find and repair. This is not covered on this page because of its rarity. Note: Monitor the condition of the fuse and/or the fusible link that was replaced for a period of days after getting the system restored. If they fail again, there is a problem in the wiring or components that may require a shop manual, special tools or professional assistance to find and repair. This is not covered on this page because of it's potential complexity. Never use a larger rated fuse or link to solve the problem; to do so is a fire hazard. 6. Temp sensor test: If step 3, Circuit test, causes the fan to run, the only circuit item not checked is the temp sensor (4.). Test the sensor by measuring its resistance with an Ohm meter when the engine is cold and then again hot. Readings should be between 2 to 3 K-ohms cold (68 degrees F ) and .30 to .33 K-ohms at 176 degrees F (~ normal temp). If the sensor tests bad, replace and repeat step 2, System check, to prove the cure. If the sensor tests good, make sure the terminal connections are clean and make good contact, then repeat step 2, System check, to prove the cure. At first reading, these procedures may seem overly involved. But taken step by step, they will provide a system check that will give you the peace of mind of knowing that the fan will indeed work when needed. A properly operating electric fan provides a certain degree of protection. It helps keep high cooling system temperatures under control whether the cause is related to extreme operating conditions or other weaknesses in the cooling system. Knowing the system is operating as it is designed is the objective of this exercise. DISCLAIMER: If while following these procedures, you cause damage to equipment or personnel, it's your fault not ours. They work, we've tried it. But we can't control what you do, so be careful.